Hyderabad, Jan 11 : A city court Monday granted bail to two editors of Telugu television channel TV 5 arrested for airing an unsubstantiated story about an alleged conspiracy behind the death of then chief minister Y. S. Rajasekhara Reddy in a chopper crash. The story based on a report by a Russian website had led to attacks on Reliance outlets across Andhra Pradesh Thursday night as the report alleged that the company had a role in the helicopter crash that killed YSR on Sep 2 last year. Hyderabad, Jan 11 : A city court Monday sent to jail for two weeks a student leader for his alleged involvement in the attacks on Reliance outlets in Andhra Pradesh last week. New Delhi, Jan 8 : The Reliance Industries Ltd (RIL) on Friday rejected a private news channel report about its a hand in the helicopter crash that killed former Andhra Pradesh Chief Minister Y S Rajasekhara Reddy. In a statement, the RIL called the report as "false" and "malicious." On Thursday night, TV-5 channek telecasted a story based on a report on a Russian website, which alleged that RIL was partner in the conspiracy behind YSR’s chopper crash. New Delhi, Jan 8 : The Editors Guild of India Friday expressed concern at some news channels' unsubstantiated reports about the circumstances leading to the death of the then Andhra Pradesh chief minister Y. S. Rajasekhara Reddy in a chopper crash. "Such reporting is sensational in nature and goes against the basic ethics, standards and principles of journalism. That such reporting triggered some violence in certain parts of Andhra Pradesh is highly unfortunate," the Guild said in a statement. New Delhi, Dec 15 - Congress MPs from Telangana region Tuesday sought action against against Y. S. Jaganmohan Reddy, son of late chief minister Y. S. Rajasekhara Reddy, for "colluding" in the Lok Sabha with Telugu Desam Party (TDP) MPs opposed to a separate Telangana state. A delegation of the MPs led by Madhu Goud Yaskhi and M. Jagannath made the demand to Defence Minister A. K. Antony, who is also chairman of the Congress disciplinary committee. Hyderabad, Dec 15 - Congress legislator Y. S. Vivekananda Reddy, brother of late Andhra Pradesh chief minister Y. S. Rajasekhara Reddy, was Tuesday arrested as he began an indefinite hunger strike here to protest the proposed division of the state. Vivekananda Reddy began the fast at the statue of Potti Sriramulu -- who died in 1952 after a 58-day hunger strike demanding a separate state for Telugu speaking people of then Madras State -- near the state secretariat. Since the police have banned any gathering and procession in the city, he was taken into custody and sent to the Bolarum police station. His followers were also arrested. Hyderabad, Nov 25 - The Congress Wednesday decided to field late Andhra Pradesh chief minister Y. S. Rajasekhara Reddy's widow Vijayalakshmi for the by-election to Pulivendula assembly that was necessiated by his death. But the family says she herself is not keen. The by-election is to be held Dec 19. 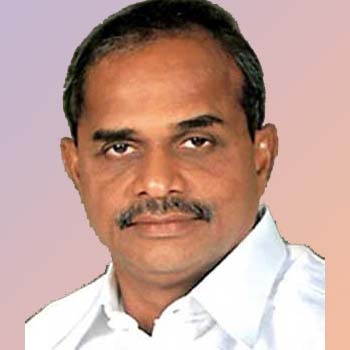 YSR, as he was popularly known, died in a helicopter crash Sep 2. Hyderabad, Oct. 24 : Memorabilia and souvenirs of former Andhra Pradesh Chief Minister YSR Reddy are selling like hotcakes across the state. Reddy, who died in a helicopter crash on September 2, was a cult figure and people want to buy anything that has Reddy''s signature mark. Seeing the surge in demand, various shops have started stacking wall clocks, key chains with Reddy''s photos especially ordered from China. Hyderabad, Oct 20 : Was it an accident or a conspiracy? The debate continues nearly 50 days after former Andhra Pradesh Chief Minister Y. S. Rajasekhara Reddy was killed in a helicopter crash. The ruling Congress party appears divided on the question, just as it stands vertically divided on whether YSR's son Y. S. Jaganmohan Reddy should be made the chief minister. Chief Minister K. Rosaiah Tuesday said the agencies investigating the Sep 2 helicopter crash were also probing the sabotage angle. Hyderabad, Oct 5 : The Andhra Pradesh government has renamed Kadapa district as Dr Y. S. Rajasekhara Reddy district in memory of the former chief minister who died in a helicopter crash last month. The government Monday issued the order renaming Kadapa, the native district of Rajasekhara Reddy. YSR, as the late chief minister was popularly known, died in a helicopter crash in the dense forests in Kurnool district on Sep 2 while he was on his way to Chittoor district to launch a government programme. In a major move, the Andhra Pradesh government on Wednesday announced that it will rename the Abhayahastam programme as Y S Rajasekhara Reddy Abhayahastam programme. Hyderabad, Sep. 6 : All 34 ministers of the erstwhile Y. S Rajasekhara Reddy government in Andhra Pradesh took oath again here on Sunday to join in the interim government led by K. Rosaiah. State Governor N. D. Tiwari administered oath of office and secrecy to the council of ministers at simple function held in the Raj Bhavan ending three days of legal and political confusion. Earlier, it was reported that some staunch followers of YSR were not ready to take oath and openly said they work only under YSR’s son Jaganmohan. Hyderabad, Sep 5 : The ''Black Box or the flight voice recorder of the Bell 430-chopper which crashed on Wednesday on the Pavurala Gutta of Nallamallah forest area, killing Andhra Pradesh Chief Minister Y S Rajashekhara Reddy, had been found by the police. The Black Box will be handed over to the five-member enquiry committee appointed by the Director General of Civil Aviation, which is likely to visit the crash site today. The DGCA team has been asked to submit the report within two months. Pulivendula (Kadapa, Andhra Pradesh), Sep. 4 : Former Andhra Pradesh Chief Minister Y. S. Rajsekhara Reddy, who tragically died in a helicopter crash on Wednesday morning, was on Friday buried with full state honours in his native village of Pulivendula in Kadapa District. Hyderabad, Sep. 4 : The Congress party''s Andhra Pradesh unit reportedly has no objection to Jaganmohan Reddy, the son of former Andhra Pradesh Chief Minister Y. S. Rajsekhara Reddy, becoming the next chief minister of the state, the party unit''s chief whip said on Friday. Hyderabad, Sep. 4 : The flag-draped and flower-bedecked coffin of former Andhra Pradesh Chief Minister Y. S. Rajsekhara Reddy left the Lal Bahadur Shastri Stadium on Friday afternoon, hours after it was placed there for the general public and leaders to pay their last respects. The funeral convoy is headed to Hyderabad''s Begumpet Airport from where the coffin carrying the body of the late chief minister, who died in a helicopter crash on Wednesday, will be flown to his native village in Kadapa District for final rites with full state honours. Hyderabad, Sep. 4 : The flower-bedecked gun carriage carrying the coffin of former Andhra Pradesh Chief Minister Y. S. Rajsekhara Reddy has reached the Lal Bahudur Shastri Stadium and is lying in state for the general public and politicians to pay their last respects and floral tribute. Former Prime Minister H. D. Deve Gowda and senior BJP leader L. K. Advani were among the leaders who paid floral tribute to the departed leader. Hyderabad, Sep. 4 : Forty-eight hours after the tragic death of former Andhra Pradesh Chief Minister Y. S. Rajsekhara Reddy in a helicopter crash, a fierce succession race has begun notwithstanding the Congress party''s decision to put off the selection of a new leader till early next week. Seeking to cash in on an emotional wave of sympathy, loyalists of the deceased chief minister have reportedly unleashed a strident campaign for making his son, Jaganmohan Reddy, the new chief minister. Hyderabad, Sep 4 : The last rites of the Andhra Pradesh Chief Minister Y. S. Rajsekhar Reddy will be held with full state honours at his native place Pulivendula in Cuddapah district today. According to sources the burial of the departed Chief Minister will be held at around 2 p. m. Before that the body of the Reddy will be placed at Lal Bahdur Shastri stadium to enable the public and supporters to pay the last respects, sources said. Hyderabad, Sep. 3 : Tens of thousands of people, from all walks of life, came out on the streets of Hyderabad on Thursday evening to mourn and pay their last respects to former Andhra Pradesh Chief Minister Y. S. Rajsekhara Reddy, who died in a helicopter crash on Wednesday morning.